The goal of this book is to summarize recent literature and current perspectives on the ecology of wetland habitats of the North American continent and the primary concerns regarding their conservation. All wetlands by definition share some characteristics, notably the seasonal or permanent saturation or inundation of soils. This waterlogging of soils and presence of standing water imposes ecological constraints on organisms and a geomorphological environment very different from those of nonwetland ecosystems. Beyond the broad umbrella of inundation and soil saturation, however, wetlands differ dramatically between and within climatic and geomorphic zones due to myriad interacting physical, chemical, and biological processes. Environmental studies or restoration projects conducted in one type of wetland in one part of North America may have outcomes that are broadly or narrowly applicable to wetlands elsewhere. This creates a dilemma for wetland scientists, students, managers, and policy makers, who must identify research projects, implement management or restoration, and develop environmental policy based on limited information. 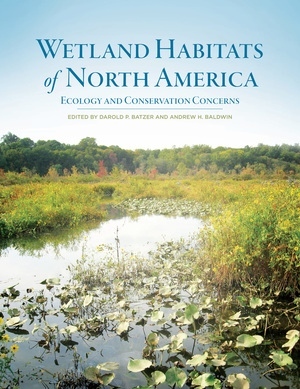 We chose a habitat and geographical approach in this book to highlight differences in the most important ecological characteristics and threats to the major types of wetlands of North America. This book is a companion volume to Ecology of Freshwater and Estuarine Wetlands (Batzer and Sharitz 2006), which addresses ecosystem processes and structural attributes of wetlands in general, across many types of wetlands. Other recent books that provide general information include Wetlands (Mitsch and Gosselink 2007), Wetland Ecology: Principles and Conservation (Keddy 2010), and The Biology of Freshwater Wetlands (van der Valk 2006). The previous edition of Wetlands (Mitsch and Gosselink 2000) included seven chapters on individual coastal and inland wetland habitats, which were updated and expanded in a separate volume, Wetland Ecosystems (Mitsch et al. 2009). Individual habitats were also treated in Coastal Wetlands: An Integrated Ecosystem Approach (Perillo et al. 2009) and in Ecology of Tidal Freshwater Forested Wetlands of the Southeastern United States (Conner et al. 2007). Our book differs from these other works in that it takes a systematic, geographic approach to capture a similar set of ecosystem characteristics and conservation concerns for all major wetland habitat types within different regions of North America. In this, our approach is similar to the Community Profile series published by the U.S. Fish and Wildlife Service. To reduce repetition between chapters, authors were specifically asked not to include general information on wetlands but focus only on studies or information collected in their region. Chapters on coastal wetlands are included in Part I of the book. They are grouped separately from non-tidal wetlands because of the overriding influence of tidal hydrology on their structure and functioning. Inland wetlands are grouped in Part II. There are many more habitat types of inland wetlands than coastal wetlands due to great variation in relative inputs of precipitation, surface water, and ground water, as well as greater surface area and richness of plant and animal taxa than coastal wetlands. Wetlands of the temperate zone have received more scientific attention than those of the tropics and arctic and hence more chapters are included on those wetlands, which primarily occur in the USA. The vast areas of wetlands in northern North America and biologically rich tropical wetlands are nonetheless important and ecologically interesting ecosystems deserving of greater study. 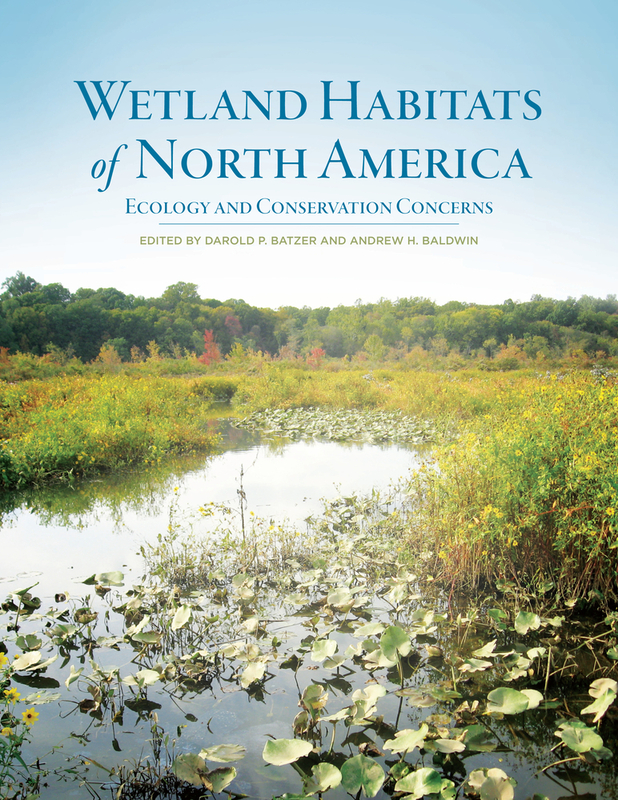 In this introductory chapter we summarize important differences and similarities between wetland habitats in different regions of North America, separately for coastal and inland wetlands and focusing on key ecological processes and conservation concerns. To assess the generality of processes and concerns as well as their regional importance we list their occurrence for each chapter in Tables 1.1 (coastal wetlands) and 1.2 (inland wetlands). This approach does not mean that some processes are not important in regions elsewhere, but may reflect a lack of literature on the topic. Differences in the relative importance of dominant or unique plant or animal taxa are also discussed here. The development of coastal wetlands is fundamentally a result of geomorphology and climate, which together create hydrologic characteristics that exert an overriding influence on wetland ecosystem structure and function. All authors of coastal chapters explicitly or implicitly identified these as fundamental controls on wetland ecosystems (Table 1.1 A). The hydrology of coastal wetlands differs considerably from inland wetlands in being dominated by tides, and to a lesser extent surface water inflows (which control salinity, nutrient supply, and sediment deposition). Ground water and precipitation are rarely mentioned in the coastal chapters. Because coastal wetlands are located in the depositional zone of rivers in estuaries, it is also not surprising that sedimentation and salinity are uniformly recognized as important. However, several biotic processes are mentioned in all of the coastal chapters, including productivity, peat accumulation, predation, outwelling, and vegetation zonation, which are discussed in more detail in this section. High primary productivity, coupled with slow decomposition rates due to anaerobic conditions, favors the accumulation of peat in soils, providing a mechanism important for the maintenance of wetland surface elevation relative to sea level. Primary productivity and peat accumulation are highlighted in all of the coastal chapters, and decomposition and anaerobiosis are featured in a majority of them (Table 1.1A). Elevation and salinity gradients within individual wetlands and across estuaries lead to horizontal zonation of emergent and submergent plants, another ubiquitous topic in the coastal chapters. Stress-tolerant species occur where salinity or depth and duration of inundation are greater (and hypoxia more pronounced), such as the lower elevations of salt marshes, but studies have demonstrated that these species are often poor competitors in fresher or higher-elevation sites, such as the higher elevations of tidal freshwater wetlands. Under stressful conditions, one species may facilitate the growth of others, for example by aerating the soil or shading to reduce salinity. Competition and facilitation are recognized as important processes in about half the coastal chapters. Some salt marsh soils become acidic when drained (acid-sulfate soils, mentioned in two coastal chapters) but coastal wetland soils are generally pH-circumneutral. High rates of primary productivity and in many wetlands structural, spatial, and species diversity of plants, result in high rates of secondary production. Coastal wetlands support estuarine foods webs not only by providing in situ habitat and food sources, but also by exporting or "outwelling" organic matter to estuaries, forming an important foundation of coastal food webs that is emphasized in all of the coastal chapters. Coastal wetlands often serve as nurseries for larval and juvenile stages of aquatic organisms, providing refuge from predation, an ecological process mentioned in all of the coastal chapters. Plant-animal interactions are also a major process in most coastal wetlands; herbivory was most frequently mentioned, both for its role in food web support but also as a disturbance process affecting plant community dynamics. Seed-related processes, mentioned in a majority of the coastal chapters, including dispersal, predation, seed banks, and seedling recruitment are often important to the regeneration of plant communities following disturbance and critical to diversity maintenance in wetlands containing a large proportion of annual species such as tidal freshwater marshes. The particular importance of storms and hurricanes is recognized for those regions experiencing regular major hurricanes, i.e., the southeastern US coasts and parts of the neotropics. Some plants and animals function as ecosystem engineers, altering the geomorphology and hydrology of coastal wetlands; examples include beavers, crabs, and dominant clonal plants. Thus, the vegetation of coastal wetlands is dynamic, in large part due to continued natural disturbance, seed and seedling recruitment processes, and competitive interactions. It is not a surprise that sea-level rise was identified as a major threat to coastal wetlands in all parts of North America (Table 1.1B). Increases in the rate of eustatic sea-level rise coupled with land subsidence in many regions will challenge the capacity of coastal wetlands to keep pace with rising sea level. Euthrophication due to inputs of nitrogen or phosphorus from point and non-point sources is also identified as important in all regions except the Pacific coast. Excess nutrients are important in shifting plant species composition and have been implicated as a potential factor in marsh die-back. Many wetlands have been hydrologically altered since European colonization, but despite environmental statutes regulating activities in wetlands, hydrologic alterations continue to threaten coastal wetlands in many regions of North America. Notably these are not mentioned as of overriding importance for south Atlantic wetlands, which are relatively unimpacted physically relative to other parts of the North American coast (except for widespread historic conversion of tidal freshwater wetlands to rice fields), and for Pacific coast wetlands, where the vast majority of coastal wetlands were lost due to diking historically but which are currently closely protected and restoration efforts are ongoing (Table 1.1B). Neotropical coastal wetlands, in contrast, were primarily used for sustainable harvest of vegetation and animal products until recent decades, when many mangrove forests have been converted to aquaculture ponds or tourist resorts. Non-native or invasive species of plants or animals are also identified as a major conservation concern in a majority of coastal wetland chapters (Table 1.1B). Exceptions are the south Atlantic coastal wetlands and the Neotropics. The south Atlantic wetlands may not face the invasive species problems of other regions due to lower ongoing physical alteration of coastal wetlands, perhaps due to lower population densities. In the Neotropics, temperate-zone plants and animals may not be able to tolerate elevated temperatures or compete with tropical plants, reducing their threat to tropical ecosystems. In addition to causing increases in eustatic sea level, changes in precipitation and temperature may impact wetlands in several ways and are mentioned in a majority of the coastal chapters. Lower precipitation may result in salinity increases in some regions where flow of freshwater to the coast is already insufficient or decreasing due to human alterations of hydrology, for example in Pacific coast and south Atlantic watersheds. Similarly, climate change may cause widespread drought, a likely factor in die-back of coastal wetlands. Higher temperatures will differentially affect the growth of plant and animal species, as well as speed up processes such as decomposition that are fundamental to wetland ecosystem function. Increases in atmospheric CO2 (mentioned in only two chapters but likely to be important in all wetlands) are not only a cause of climate but also will alter plant community dynamics and potentially other ecosystem processes as well. Increasing human population density (identified in three coastal chapters) continues to threaten coastal wetlands via watershed development, land use changes, harvesting of plant and animal resources, and further hydrologic alteration. These and the other conservation concerns are related and linked in complex ways that require novel research approaches to untangle. Manipulative experiments that examine multiple processes together can provide insights into how factors such as CO2, nutrients, salinity, and temperature interact. Coupled with observational studies and system modeling progress can be made toward greater understanding and prediction of how human activities are affecting coastal wetlands. However, the chapters in this book highlight that coastal wetland research must be multidisciplinary so that interactions between hydrology, climate, geomorphology, biogeochemistry, and organisms can be explored. As for coastal systems, hydrologic variation was identified as an important control on ecology by every author addressing inland wetlands (Table 1.2A). Given that inland wetlands can be fed by various sources of water (precipitation, ground water, riverine flows), and water budgets can vary greatly either spatially among and within wetlands, or temporally among and within seasons, years, and decades, the importance given to hydrology was to be expected. Geomorphic and climatic variation were also identified as being important controls by most authors, primarily because these are the factors that most influence the hydrology of inland wetlands. The chemical nature of the water including nutrient levels (phosphorus, and to a lesser extent nitrogen), pH, oxygen level, and salinity (especially in western wetlands) was also considered important. It is clear from Table 1.2A that the abiotic template dictated by the physico-chemical conditions of water is considered the major control on the ecology of inland wetlands. However, biotic interactions in inland wetlands were also considered important influences by most authors (Table 1.2A). Bottom-up controls were most frequently discussed. Nutrient limitation of plants from P and N, as well as competition for light and space were common themes. Mutualism, especially in relation to nitrogen fixation by plants/microbes, was discussed in five chapters. Plants as food (herbivory or detritivory) or as habitat were considered crucial bottom-up controls on wetland animals by most authors. Top-down control from predation, either on other animals or on plants, was identified as an important control by about half of the authors of inland wetland chapters. Control of wetlands by keystone animal species was another important top-down impact, with beavers being by far the most influential animal. The impact of disturbance was a third general theme developed by authors for inland wetland chapters. Fire was identified as an important control in half of the chapters, particularly those focusing on the Southeastern USA. Storms (primarily hurricanes in the Southeast and tropics), and floods and droughts were other important disturbances. With the general importance of disturbance in inland wetlands, successional processes were identified as important controls by half of the authors. Landscape features as controls on inland wetlands was the final major theme developed by authors. As mentioned, geomorphic variation was considered a crucial impact on wetlands by most authors, and besides the impacts on hydrology, direct impacts of soils and topography were often identified as being important. Habitat connectivity across landscapes (e.g., isolation, patchiness) and interactions between uplands and embedded wetlands was a major theme, particularly for depressional habitats. Since hydrology is considered the major ecological control of inland wetlands, it follows that any impacts on water budgets for wetlands would be of particular concern (see Table 1.2B). Many of the authors of inland wetland chapters highlight threats from climate change, primarily because of concerns about potential hydroperiod alteration. Other concerns included under the umbrella of hydrology were impacts of flow regulation of rivers by dams and levees on riparian floodplain wetlands, impacts of groundwater pumping on assorted wetlands, and continued concern about any management that drains wetlands. While most author concern focused on the threats posed by making wetlands drier, some chapters point out that factors that increase hydroperiods also need to be considered. For northeastern seasonal wetlands (Chapter 10), the authors point out that past mitigation efforts that have focused on developing long-hydroperiod ponds may actually pose a threat to seasonal wetland pools, as important functions associated with seasonal flooding are not being replaced. The theme of restoration was developed by several authors, again with the over-riding theme focusing on restoration of natural hydrology. Another major theme of authors reegarding the conservation of inland wetlands focused on biodiversity issues, primarily threatened or endangered species. Because many inland wetlands exist as isolated patches on the landscape, it is not surprising that endemic species, or at least species that occur across a restricted area, can be common. As these habitats are destroyed or degraded, resident species may become threatened. Because wetlands support biota unique from uplands, the value of embedded wetlands in buttressing overall regional diversity was frequently mentioned. Several authors point out that connectivity among wetland patches and between wetlands and the surrounding uplands all need to be considered when assessing the integrity of overall wetland systems. A group of conservation threats to inland wetlands received a similar level of attention by authors. Agriculture and water pollution have long been associated with the decline of inland wetlands, and both themes were still highlighted by authors of this book. However, threats from urbanization and other development, and from climate change are now receiving a similar level of focus. The threat from invasive species, particularly plants, was another pervasive theme (similar to coastal wetlands). Threats from livestock grazing were mentioned by nearly every author addressing western North American habitats. Because many "isolated" inland wetlands have recently lost legal protections from the USA Government (e.g., Downing et al. 2003), concern over wetland regulation in the USA was another important theme for many authors. However, concerns were not limited to just recent statutory changes, but a general angst existed about the adequacy of current laws protecting inland wetlands. Several authors expressed concerns over the effectiveness of wetland monitoring programs, and also of declining appreciation of wetland virtues among the general public. This synthesis suggests some interesting ecological differences between coastal and inland wetlands. To some extent this reflects the perspectives of the researchers working in each type of wetland, but ecological controls are probably unique in many ways. In general, abiotic factors, hydrology, geomorphic variation, and climate, were identified as important controls in most inland chapters. Only two biotic processes or controls, nutrient supplies and plant-animal interactions, was featured in more than half of these chapters. Similar abiotic processes and additional abiotic factors of salinity and sedimentation were recognized in all coastal wetlands. However, biotic controls and processes were mentioned more frequently in coastal than inland wetlands. In particular, outwelling and trophic support, primary production, plant-animal interactions, decomposition, seed and seedling processes, competition, and habitat connectivity were all featured in more than half of the coastal chapters. This difference in the relative importance of biotic vs. abiotic ecological controls and processes may reflect the highly variable nature of hydrology in inland wetlands verses the relatively constant hydrologic regime of tides in coastal habitats. Given the more stable environment in coastal habitats, biotic interaction may be permitted to become particularly influential. Biotic interaction is likely also important in inland wetlands, but outcomes may be hard to predict because the abiotic foundation is constantly changing. In coastal wetlands, the trophic connection between the wetlands and the open waters of the ocean through outwelling was considered one of the most important ecological controls or processes. Except perhaps in Great Lakes wetlands and floodplain wetlands, this kind of relationship does not exist in inland wetlands. On the other hand, because inland wetlands are often embedded in uplands, the interaction between wetlands and surrounding landscapes was frequently highlighted by authors addressing those habitats. Despite some differences in ecological interactions, perceived threats to both coastal and inland wetlands were remarkably similar. In all wetlands, concerns about human-induced hydrologic change (whether from development or climate change) seem paramount. Climate change, invasive species, and land use changes are clearly among the most serious threats to the persistence of all wetlands. Regulatory policy that promotes the conservation and sound management needs to be strengthened fro all wetlands, and wetland restoration practices need to be improved overall. These actions can moderate the effects of human population growth and activities on wetlands so that their ecological and socioeconomic functions and benefits can be maintained.